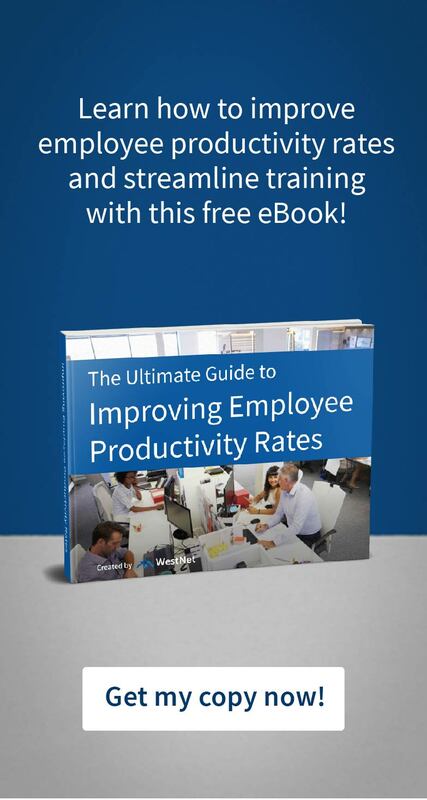 Learning how to increase productivity can be a painless process for training professionals. If quarterly reviews and voluntary self-reporting represent the entirety of your employee productivity monitoring program, then it is likely that you are placing yourself and your employees at a distinct disadvantage. That’s because key success indicators like time management, employee training knowledge retention, and trends in productivity in various contexts and time segments cannot be accurately measured a general overview or haphazard self-reporting. Without a clear picture of your team’s strengths and weaknesses, it will be impossible to create an accurate roadmap for your employee’s success. That means efforts to train your workers to meet their goals may be based on guesswork at best or cause them to misdirect their efforts in an attempt to manage their workflow. The Takeaway: With the right technology such as an LMS, continuing education for mediocre performers can be individualized to target problem areas in worker performance, while helping them hone necessary skills and areas of strength needed. If your organization is struggling with data management, then your employee’s productivity may be impacted. That’s because, without the actionable insights that accurate employee productivity data provides, it is unlikely that you will find the source of mediocre performance results with any speed. Managing employee performance data manually, as some organizations still do, is risky and time-consuming. Data corruption is often due to human error, and it is likely that as your organization grows, the risk for data mishaps will only increase without a robust performance data management system in place. The Takeaway: As a training professional it is essential to have easy access to historical and real-time employee performance data as well as a user-friendly educational testing platform to diagnose the origin of productivity issues. As new employees adapt to their new roles, it is essential that they receive a comprehensive onboarding experience and continued support as needed. If your team is exhibiting mediocre performance, it is possible that the fault may lie in insufficient training. Using a learning management system (LMS) platform that integrates onboarding, performance monitoring, and continuing education is key to optimizing your employee’s talents. The Takeaway: Poor employee on-boarding, continuing education, and performance monitoring processes can all contribute to mediocre worker performance over time. Employee productivity monitoring is a resource-intensive undertaking that can lead to additional productivity drain just because of its complexity. Whether you are attempting to develop a new performance monitoring strategy in response to lackluster results or you are trying to find a way to verify employee self-reporting of time management practices, you are spending precious time on a task an enterprise-grade platform could seamlessly accomplish. An enterprise-grade LMS makes performance monitoring and educational interventions simple to implement and maintain. Are my employees exhibiting peak or increasing performance levels in multiple contexts over time? Are current or potential low-performers easily identified and supported through an issue-focused intervention curriculum? Is my present curriculum adaptable to diverse learning styles and levels of educational need? If you answered no to any of the above questions, then it is time to find a platform that was built for growth. Review high and low performers with an eye to changes in productivity over time. Look for the impact of context when looking at upticks or downward shifts in performance. Were there workplace issues that may have contributed to performance lag, such as personal conflicts? Examine the quality of the on-boarding process. Employee knowledge retention after initial training should be high for the majority of your employees. Can most workers demonstrate mastery of the essential skills needed to manage their workflow effectively? Make sure that benchmarks and performance standards are abundantly clear across your organization. The only way to ensure that your staff is prepared to achieve excellence is to maintain an ongoing educational program that supports compliance with performance standards. Does your performance management system empowers your employees to self-assess and easily access educational support as needed? The WestNet Learning platform provides a user-friendly employee performance monitoring system that works seamlessly with the LMS. When you are free from the need to jump from platform to platform to create a solution, it is simple to identify productivity problems and create an educational intervention that provides individualized learning as needed. WestNet Learning allows you to develop a customized response to productivity issues while providing extensive support for a curriculum that facilitates performance excellence. We make it simple to address productivity issues and develop advanced training modules in response. WestNet Learning empowers you to focus on developing high-quality content, not administrative or technical tasks. Ready for outstanding support? It starts on day one for every client. Our comprehensive training and tech support will make your transition to our platform frictionless. From data management to educational interventions, we’ve been creating custom solutions for our clients for decades, helping their employees build successful careers. Connect with us to learn how we can help you improve your employee’s productivity and exceed their goals. If you would like to learn more about how to increase productivity rates from mediocre to exceptional with technology, schedule a free 1-on-1 strategy session with one of our solution specialists today!